Thanks for your comment. I've just looked at your web site, some amazing shots there. I must get out more! I also love your photo, as drewaz does. The sky is magnificently captured, the different types and layers of clouds are indeed interesting and attractive. Well done. 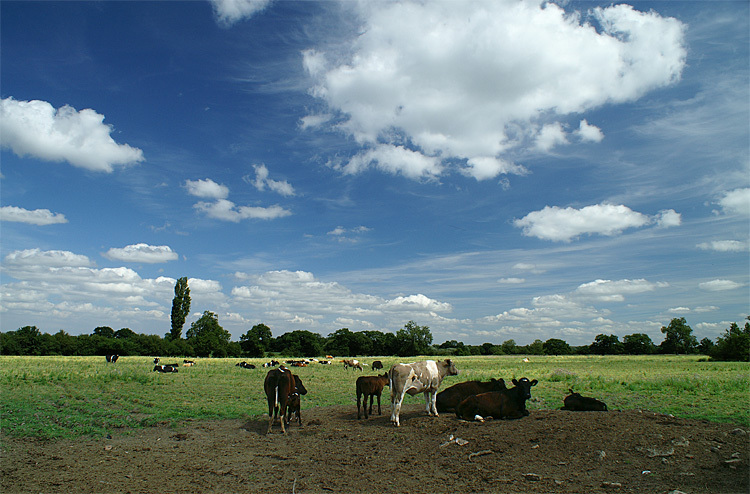 Maybe it's my monitor or eyes, but it seems maybe at the expense of a blue sky the photo does seem a bit on the "cool side" (meaning a bit of a blueish colour cast), especially noticeable on the grass and cows. However it doesn't detract that much from a great photo. Thanks for sharing and welcome to this forum as I see you're new here! whoops.. my computer or internet seemed to freeze, then it posted my answer several times! The sky or the foreground can be important depending on what the photographer sees there. In this case the sky tells it all, coast to coast. This picture works for me. That said, my eyes aren't trained to see the ''coolness'' the other poster mentioned so I can't see what it is he's talking about. What a great forum this is. To get comments on our photo's from people all around the world. It makes such a difference to have a photographer's opinion rather than another family member saying something like " That's nice dear"!